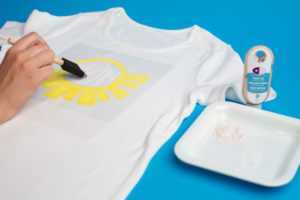 Have you ever tried to apply fabric ink to a t-shirt using a stencil? That’s what we’re going to walk you through right now using stencil vinyl and UV light–sensitive fabric ink. The ink looks creamy white when you’re indoors, but as soon as you go outside into the sun, your inked design will show its true colors and display as a bold, darker color. 1. Open the Here Comes the Sun design (Design ID#269748) in Silhouette Studio®. Remember that you are using this as a template, so you might want to draw a rectangle or square around your design to make it easier to weed out the design and leave the negative space. 4. Weed the design, but don’t weed the negative space like you normally would. Remember, you are making a stencil to apply your design, so you need to weed away the actual design. Also, keep the centers of the letters. 2. 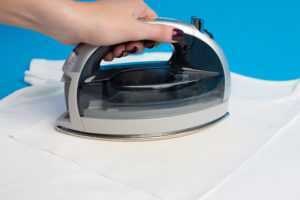 Place the vinyl on your project. Press down firmly and carefully remove the transfer tape. Place a thick piece of cardstock under the material you are going to apply fabric ink to in order to prevent ink from bleeding through. 3. 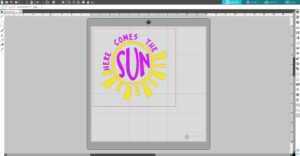 First we will apply regular yellow Silhouette fabric ink on the sun design only. Use a paint brush or sponge to apply the fabric ink. When you are applying ink, be careful and not go over the stencil borders and not to apply any ink to the letters yet. We will use a different kind of fabric ink for them. 4. 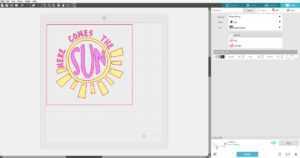 Now apply purple Silhouette UV light–sensitive fabric ink on the “here comes the sun” words, and let the ink dry. 5. Remove the stencil vinyl. 6. 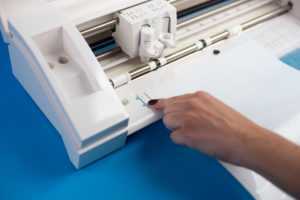 Place a piece of cloth on the top of the fabric ink design and iron on top for a couple of seconds to set the ink. Now our T-shirt is ready to wear. This design is so much fun. You can’t see the words when you’re inside, but the UV light–sensitive fabric ink pops up when the design is in the sunlight! Amazing!